This photo, the Infinity Sign, is like a symbolical sign of eternity, if you look at it with some thought. On a cool spring morning we went for a walk with my husband. We decided to walk the river embankment and ended up standing in front of the 700-year-old Cathedral of Turku. I had taken my camera with me to take photos of a cycling event that day, and so I thought I might take a few photos of the walls of the old cathedral. I love old structures and buildings - their walls and their scars speak volumes of our history. The lowest level of the cathedral was made of big stones, and from these the walls rise, and the tower reaches the height of 85,5 m (that's 280 feet). As in any old church there are memorial slabs made of stone on the floors and in the walls. And so it is in Turku Cathedral also. Right at the back of the church, outside, behind the altar, is a worn slab. On each corner it has an iron ring. This one ring had turned down, leaving its identation visible. The sight intrigued me so I took this photo. It looked like a figure eight - or the infinity sign, a symbol of eternity. To see this as such a sign was so fitting - being attached to a building of faith, where people search for their connection to the eternal life. You could look at the iron ring as our earthly life, and the indentation as the spiritual life. And just as the iron ring is attached to the upper loop and hangs from it, our eartly existence is tied to our spiritual life. You don't need to be religious, but you can still be spiritual. You, like any other person, search for a good feeling place where you are at peace with yourself and the world. To me this photo also represents the friends who have already left their earthly existence. Our relationship still exists - even if it looks like there are "only" memories left, I believe they still exist, and their spiritual presence, together with the good memories, give me strength. Even if the subject may not look very flashy, this is one of my very favorite photos. It reminds me that in reality we are spiritual beings. Should you take away the iron ring, the spiritual side of us remains - and hopefully has left its mark in this physical world. Back to Homepage from the Infinity Sign. Back to It's a Wonderful Life. If you wish to see the Infinity Sign photograph in sharp detail, click on the photo. 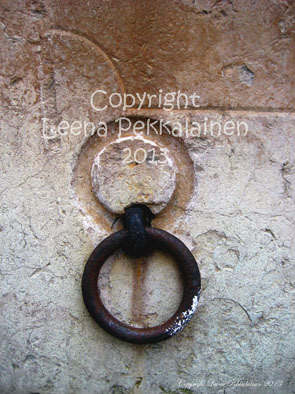 If you wish to get this symbolical picture as a print or postcard, you are more than welcome to do so.